If you're an experienced aquarist, chances are you've considered the idea of owning a pet shark. While most sharks are far too big for a home aquarium, the Brownbanded Bamboo Shark is an exception to the rule. At about 41 inches long, it can be kept in a large 180-gallon tank along with other compatible fish, and it often does well in captivity. The only real challenges in keeping these sharks relate to feeding and health issues: you may need to "target feed" your shark to be sure it eats properly and to provide it with medications needed to maintain its health. 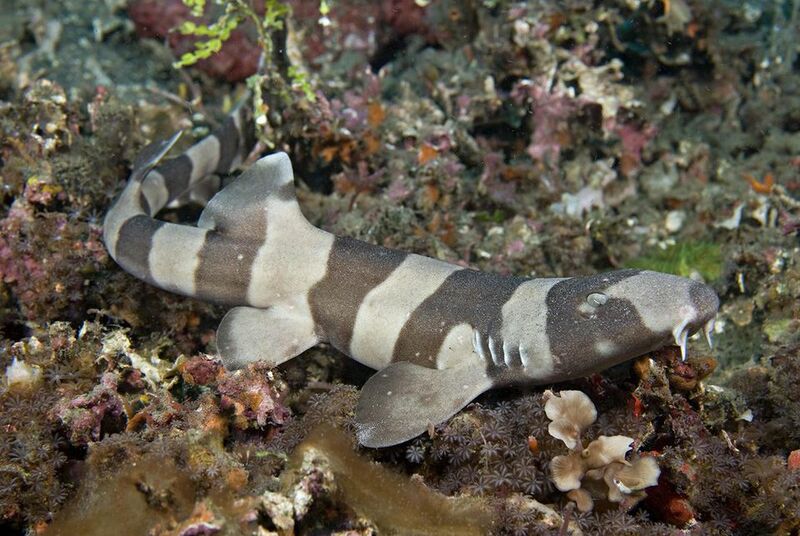 Common Name Brownbanded Bamboo Shark, Cat Shark, Brown-Banded, Banded, Brown-Spotted, Black Banded, and Blackbanded Bamboo Shark, Cat Shark or Catshark. The Brownbanded Bamboo Shark originates in the Indo-West Pacific. It may be found from Japan to northern Australia and prefers depths of about 85 meters. They frequent coral reefs, where they find plentiful prey. These impressive cat sharks sport barbels around their noses which are the source of their name; these are sensory organs that help the fish to navigate. The young have the beautiful banded markings, but these fade with maturity and adults have none at all. They grow to over 40 to 50 inches long when fully grown. They may be grey with black strips, or cream colored with brown stripes; as adults, they may develop brown spots between their less-prominent stripes. This species is not reef-safe: it will nip at and eat crustaceans and coral and eat smaller, less aggressive tankmates. As a result, it's a good idea to keep your Brownbanded Bamboo Shark in a fish-only aquarium with relatively large, aggressive species that can hold their own with a shark. Good tankmates include Eels, Groupers, Snappers, Hawks, Hogs, Rabbits, Lions/Scorpions, Grunts/Sweetlips, Sharks and Rays, larger Angels, Parrots, Tangs/Surgeonfishes. Triggers and Puffers will nip at the shark's fins and cause them undue stress. Being a nocturnal, bottom-dwelling species that inhabits deeper waters where little light is present, the Brownbanded Bamboo Shark is light sensitive. Typically it stays hidden in an aquarium with bright lights on, and therefore should be provided with an adequately sized cave or light-sheltered space where it can hide. Course textures can scratch this shark's belly, which can lead to infection, so it requires a soft sand substrate. Poor aquarium water quality and chemistry can be problematic for this species. A docile fish that does not swim around much, Brownbanded Bamboo Sharks are nevertheless strong fish that can easy dislodge unstable rock formations and corals that are not attached securely. To avoid possible damage to the structure of the aquarium and injury to the shark and its tankmates, all items should be stable. Like all sharks, Brownbanded Bamboo Sharks are carnivores and should be fed a meaty diet that includes pieces of fresh shrimp, scallop, squid, and marine fish flesh. Soaking foods in a liquid vitamin provides a boost in vitamins and minerals important to this shark's health. They also require a supplemental source of iodine to prevent goiter disease. Because they are fairly docile, they do not compete well for food with aggressive feeders. If they are sharing a tank, you may need to offer them food directly, using a stick or tongs. They should be fed until satisfied 2-3 times a week. The Brownbanded Bamboo Shark has a small mouth that it cannot open very wide, and it does not bite off pieces of food. It should be given tiny bits of food that it can easily consume whole, otherwise, it may ignore and even spit out chunks that are too large. It can be difficult to get juveniles to eat. Adding a natural scent and flavor enhancer such as Seachem Entice, and introducing live farmed-raised saltwater feeder shrimp (White Shrimp) to the aquarium can help to pique a stubborn feeder's interest. It is not unusual for a baby or a juvenile specimen to not start eating right away, and the shark will often starve to death before doing so. Before buying one of these sharks, be sure it is healthy, especially in regards to how the shark is eating! Males' pelvic fins have tube-shaped organs called claspers. These organs that deliver sperm into the female's reproductive tract. Bamboo or Cat Sharks are egg-layers, with the eggs enclosed in elongated flattened egg-cases. It's not unusual to find the eggs for sale, and in captivity, hatching one can take up to four months. If you are seriously interested in breeding these sharks, you will need to dedicate quite a bit of time to properly managing the process of hatching and caring and for juveniles. This and related species sharks are prone to developing a goiter, a lump that appears on the outside of the throat area. Starting out as a small lump, over time it can develop into a very large growth that blocks the shark's throat, which prevents it from eating. A goiter is the result of the lack of iodine in the shark's diet. It takes many months for one to develop, and takes just as long to reverse it. It's important to take steps to supplement the shark's diet with needed iodine when a goiter is first noticed. If left alone, once it grows too large, at this point it's too late to save the shark, and the animal slowly dies from starvation. Copper-based medications should never be used on this shark, so be sure to read the labels on products carefully.